Although the NFC West championship and home field advantage is still all but certain, if for any reason we completely fall apart and miss out on either of these two scenarios this is the game the Seahawks and their fans will look back on as the turning point in the season. The Seahawks 7 game losing streak has come to an end and our quest for the division title must wait at least one more week as the Seahawks fell to the San Francisco 49ers 19-17 on Sunday. The Seahawks fall to 11-2 and now lead the 9-4 49ers by 2 games in the NFC West. There are a lot of frustrating moments that may have ultimately changed the outcome of the game. This is what I saw. 2nd Half Defense Does its Part: Over the past couple of seasons the Seahawks have been one of the best teams in the league when it comes to halftime adjustments and improvements. The defense stepped up and shut down the 49ers offense in the second half, holding them to only 3 points (for the sake of this section, forget those points were the ultimate difference in the game). The defensive pressure on 49ers quarterback Colin Kaepernick was cranked up as Clinton McDonald and Chris Clemons each recorded a crucial sack on third down plays in the fourth quarter. Byron Maxwell once again stepped up in place of Walter Thurmond, recording 5 tackles, 3 passes defensed, and an interception. 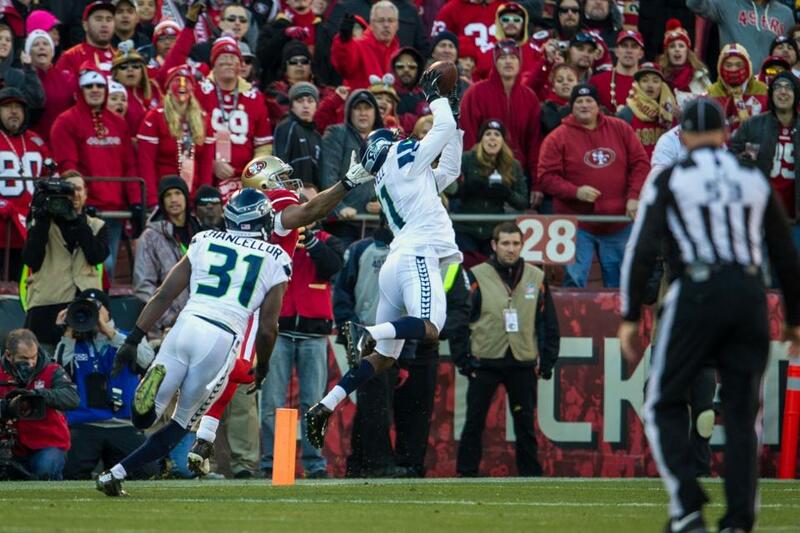 Overall the Seahawks defense only allowed 19 points to a solid 49ers offense which should be enough in order to win. Unfortunately the Seahawks failed to get any momentum going on offense to parallel the effort of the defense. 2nd Half Offense Fails to Show: When I went to Houston back in September the Seahawks were down by 17 points at halftime. Although I was surprised and disappointed I never gave up hope that the Seahawks could comeback because prior to that game they had proven that they could come back facing a deficit of at least 20 points. The Seahawks trailed the 49ers by 2 points at halftime and my overall feeling was that Darrell Bevell and Russell Wilson would make the necessary adjustments for the offense to comeback, take the lead, and potentially blow this game wide open. That never happened. The Seahawks only scored 3 points of their own in the second half and missed opportunities denied Seattle the chance to extend drives and perhaps put points on the board. Marshawn Lynch only ran for 72 yards and a touchdown on 20 carries and it felt as though the Seahawks number one priority this week was to move the ball through the air even though Russell Wilson only threw the ball 25 times for 199 yards, a touchdown, and an interception. I give lots of credit to the San Francisco secondary, especially cornerback Tramaine Brock and safety Eric Reid for their impressive blanket coverage on all Seahawks receivers. As the game went along the belief remained that the Seahawks would make a run at taking control of the game because I knew they could but as the minutes ticked off the clock the worse our chances became and by the time we got the ball back for our final drive it was too little too late and the clock had struck midnight. Penalties Doom Seahawks: While watching Sunday NFL Countdown on ESPN in my hotel room prior to leaving for Candlestick Park, one analyst boldly predicted that this week’s Seahawks/49ers game would break an NFL record for most number of penalties in a single game. It sure felt like he was right but the calls that went against the Seahawks came at the worst times. Instead of extending drives, penalties backed the Seahawks so far back that the drives predictably stalled and the Seahawks were forced to punt, trading potential points for goose-eggs and a change of possession. In a nutshell, I strongly believe that the 49ers did not beat the Seahawks but that the Seahawks beat the Seahawks. Two Marshawn Lynch first down runs were called back for holding, a long completion to Golden Tate was called back for offensive pass interference because Tate pushed off of his defender, and on a 4th and 5 while in punt formation it appeared that a 49er defender jumped offside, which caused the Seahawks to point towards the other side of the line of scrimmage. Instead of a 5-yard offsides penalty and an automatic first down, it was ruled a false start and the Seahawks backed up 5 yards. In total, the Seahawks committed 9 penalties for 85 yards. About half of those penalty yards came on long, potential game altering plays. The Gamble and the Two Plays that Changed the Game: After the Seahawks took a 17-16 lead the 49ers got the ball back with 6:20 left in the game. The Seahawks had two timeouts to work with and with the way the defense had been playing, I felt that it was entirely possible that we could force a quick drive and get the ball back to attempt to pad our lead. Instead, the 49ers gave the ball to running back Frank Gore who galloped 51 yards on the fourth play of the drive and all of a sudden the 49ers went from having the ball in their own territory to having the ball in the red zone, well within field goal range. After Kendall Hunter ran for one yard on the next play coach Carroll decided to take our second timeout and it was clear how he was going to play the end of the game; use both timeouts and the two-minute warning to stop the 49ers with enough time to allow them to kick a field goal and for us to go down the field into field goal range for Steven Hauschka to win the game. Carroll used the Seahawks final timeout after a 2-yard run by Gore and all the Seahawks needed to do was stop San Francisco to set up a 49ers field goal with 2:00 left. Instead Carroll’s gamble backfired and the Seahawks allowed the second most important play of the game; a first down scramble by Kaepernick to give San Francisco a fresh set of downs and the ability to run the clock down under a minute, kick a field goal, and leave the Seahawks virtually no time to go down the field and score. If I was Pete Carroll I would have waited to use our timeouts after the two minute warning which would have given us about one extra minute of game clock. I do not blame Carroll for the decision he made because he had trust in a unit that had not given up any points in the second half up until this point in the game. Unfortunately it nipped the Seahawks in the bud. 49ers Played Like They Wanted it More: On Saturday night, Mitch Levy of Sports Radio 950 KJR tweeted that the attitudes and body language of 49ers players in interviews leading up to this week’s game showed a team that was uptight; so uptight that, as Levy stated “you can’t get a blade of grass up their asses.” San Francisco sure did not play like that at all. The 49ers came out firing with full confidence and I got the sense that they did a remarkable job preparing for what the Seahawks were going to throw at them on both sides of the ball. They fed off the energy of their home crowd and scoring 16 points in the first half alone gave their defense extreme confidence to shut the Seahawks offense down. The 49ers did not play as an uptight team, but as a team that had a “we have nothing to lose” mentality when in reality this was a game they definitely needed to win to continue to control their own destiny in the NFC wild-card race. Injury Analysis: Linebacker K.J. Wright broke a bone in his foot on Sunday and there is an estimated recovery time of at least six weeks. If that is the case, Wright could make it back in time to play in Super Bowl XLVIII should the Seahawks make it. Wright however remains hopeful that he will be healthy enough to return in time for the start of the playoffs, as was portrayed on his Twitter shortly after Sunday’s game. Max Unger and Jeron Johnson also exited the game this week and both did not return. Unger is dealing with a strained pectoral muscle and Johnson pulled a hamstring. To my knowledge their statuses for next week against the New York Giants is unknown. Losing Wright, a starter on defense, hurts but Malcolm Smith stepped in for Wright and did a good job. Unger is the man I would be the most worried about. Unger is the anchor of the offensive line and if the Seahawks are going to be without him for any length of time, we may see shades of the Seahawks teams that struggled against St. Louis and Tampa Bay. Thoughts on San Francisco: The 49ers looked like a team that could make the playoffs as a wild-card and make a run deep into the playoffs, assuming of course that they do not run into Seattle along that road. The defense played a really good football game and if Frank Gore is feeling it he is extremely hard to stop. The addition of Michael Crabtree back into the lineup also adds firing power to the cannon of Colin Kaepernick. If the 49ers have to come to Seattle in the playoffs they will most likely lose but I would not be surprised to see the 49ers make it to at least the divisional round if not the NFC Championship Game if they are able to play like they did on Sunday. Random Thoughts: All of my random thoughts will come in an in-depth feature post on my entire weekend trip to San Francisco. I hope to have that post published by mid-week. Stay tuned! In addition to “Weekend in San Francisco 2013” post in the middle of this week, make sure to check back on Saturday as I preview next week’s matchup with the New York Giants. Go Hawks! In his weekly press conferences, Russell Wilson religiously states that each game “is a championship opportunity.” For the first time this season Wilson’s mentality can be taken literally. This week, in one of the more highly anticipated games of the week, the Seahawks have the opportunity to clinch the 2013 NFC West title and a first round bye in the NFC playoffs. In their way are their arch rivals, the San Francisco 49ers. The Seahawks are 11-1 and are coming off of a thrilling 34-7 win over the New Orleans Saints last Monday and will take on the 49ers in San Francisco on a short week for the second consecutive season. The 49ers enter this week’s game at 8-4 and they are coming off a 23-13 win over the St. Louis Rams last week. Although coming back to win the division is highly unlikely, the 49ers are battling several teams for the final NFC wild-card playoff berth and a win this week would certainly help their case to make the playoffs. The Seahawks lead the all-time series with the 49ers 15-14 and Seattle defeated San Francisco 29-3 in their last meeting back in September. Here is what I will be looking for from my upper deck first row seat at Candlestick Park on Sunday. Russell Wilson has started 29 career games for the Seahawks and the worst performance of his young career came last season in San Francisco. At that point last season the Seahawks had yet to unleash their entire playbook and I believe playing conservatively cost the Seahawks multiple scoring chances and ultimately the game. This year things are different. I believe that Pete Carroll will try to feed Marshawn Lynch the ball early but in the later parts of the game I expect to see the “Russell Wilson show.” I think that the read option will be a pivotal part of the Seahawks offense this week. I realize that the 49ers will be preparing for everything the Seahawks pose as a challenge but the read option has not be used on a regular basis over the past few weeks, simply because we have not had the need to use it. The read option has turned into an emergency package that is only used in excess when the Seahawks are struggling or trailing late in games. I could see the Seahawks struggle in the first half of the game and if Seattle is leading by one score or if they are trailing, halftime adjustments will be made with a serious attempt to unleash Russell Wilson and the read option. I believe that Wilson is just now starting to play his best football of the season and using him in read option this week could put the 49ers at a serious disadvantage. When it comes to the Seahawks defense this week, there are several things that concern me. Seattle has faced 49ers quarterback Colin Kaepernick twice but never at Candlestick Park. That plus the return of wide receiver Michael Crabtree from a torn Achilles adds a wrinkle that could put the Seahawks at a disadvantage because there is only one game’s worth of Kaepernick/Crabtree game film this season; last week against St. Louis. Forcing turnovers and getting off the field on third down will be very important for the Seahawks defense this week but the main key to controlling the ball and preserving a victory will be to put excessive amounts of pressure on Colin Kaepernick. In preparation for this week, I suspect the Seahawks paid very close attention to the game film of the 49ers game against Carolina from four weeks ago when the Panthers were able to sack Kaepernick 6 times and held him to a career-low 91 yards passing. Although the sack totals have not been present over the past couple of weeks the Seahawks have been doing a much better job of putting pressure on opposing quarterbacks. Look for Cliff Avril and Bruce Irvin to step up and have big games for the Seahawks on defense this week. The San Francisco 49ers offense has proven to be a rather shaky unit this season. It seems as though they play well against average or bad defenses and they struggle immensely against good defenses. Although San Francisco has Michael Crabtree back I would not be surprised to see him make a minimal impact this week. In last season’s matchup in San Francisco, running back Frank Gore rushed for 131 yards on 16 carries. If the 49ers are to have any offensive success this week it starts with Gore. If Gore is effective against a Seahawks run defense that has vastly improved in their last three games, that opens up the offense and could help Anquan Boldin and Vernon Davis get open, thus the 49ers offense will be two-dimensional. If the Seahawks shut Gore down, the passing game will become the focal point of the offense and the Legion of Boom will have an easier time creating confusion for Kaepernick in the passing game. The 49ers defense has been consistently good all season long. A solid front seven is starting to gel with a young secondary to create a strong cohesive unit. Much like it is a key for the Seahawks defense to stop Frank Gore, it will be equally as important for the 49ers defense to be able to stop Marshawn Lynch. The 49ers allow an average of 105 rushing yards per game and I believe they will have keep Lynch to fewer than 100 yards rushing on Sunday in order to have a chance to win. For San Francisco to do this I put my spotlight on the middle of the 49ers defense. My X-Factor player to watch this week is 49ers defensive tackle Glenn Dorsey. Prior to last week against St. Louis, Dorsey’s most productive game of the season came in Seattle in week 2 when he recorded 5 tackles. In San Francisco’s base 3-4 defense, Dorsey is mostly responsible for clogging running lanes on the interior of the offensive line, with the help of linebackers Patrick Willis and NaVorro Bowman. On interior running plays it will be Dorsey’s responsibility to make initial contact with Marshawn Lynch or Robert Turbin to slow them down or to make the solo tackle. Lynch likes to pound the ball on the inside and run defenders over so Dorsey will have the chance to make a big impact in this game. A solid performance by Glenn Dorsey could help propel the 49ers to force turnovers, manage the game clock, and control the tempo of the entire game. Random Thoughts: I am once again going to bank on the Seahawks wearing white jerseys this week. I think they have maxed out the number of times they can wear their grey alternate jerseys so I’m going to be packing my white one. Please wear white, Seahawks. I don’t want to wear the wrong color jersey on both of my road trips this year… Joe Buck and Troy Aikman have the call for “America’s Game of the Week” on FOX… Clete Blakeman is the referee this week. Remember, Blakeman and his crew were the ones responsible for waving off pass interference at the end of the Patriots/Panthers Monday Night Football game… I have been looking forward to this weekend since I booked airfare and bought tickets to the game back in May. I am excited to experience a Seahawks road game for the first time with my friends James and Grant. Even though I have given them excessive information about what to expect on gameday in San Francisco, they really have no idea. They are just going to have to experience it for themselves. My gut feeling is that they are going to have a blast… To all Seahawks fans heading down to San Francisco with us this weekend, don’t forget about the 12th Man takeover at Pier 39 on Saturday night. The “attending” count on the Facebook event is currently at 900 so it is going to be very crowded… And very fun!… I’ll be tailgating in the southern part of the Candlestick Park parking lot most likely… The 49ers are giving away red rally towels this week so of course we are going to counter. We will be waving white Seahawks rally towels so be on the look for us. For those watching on TV, we are sitting on the Seahawks sideline on the north goal line in the first row of the upper bowl (left side of your screen)… I find it hilarious that the 49ers sent out their version of “Ram Rules” to their season ticket holders this week. If I were a 49ers fan I would be completely embarrassed and pissed off. I’ll be sure to use that in any friendly trash talk we engage in on Sunday… I’m also excited to see the Seahawks banner fly over the Stick before the game. It seems like the 12th Man is getting more and more creative when it comes to making an impression on road trips… Let’s clinch this division. I don’t want to sit at the airport gate unhappy after the game. It would be an incredible feeling to be en route home knowing we are the 2013 NFC West champions and I was there to witness it. Seahawks Playoff Outlook: As previously stated, the Seahawks can wrap up the NFC West and lock up a first-round playoff bye with a win this week. San Francisco can boost their chances at earning a wild-card berth with a win. The winner of this week’s Sunday Night Football game between Carolina and New Orleans will have control of the NFC South. Here are this week’s games to keep an eye on with potential NFC playoff implications. Teams to note are bolded. Prediction: Although this game will be higher scoring than last year’s Seahawks/49ers game in San Francisco, it will still feel like more of a defensive battle. Russell Wilson will throw for one touchdown and will also run for a score. Frank Gore will score the only 49ers touchdown. I am 1-2 when seeing the Seahawks play the 49ers at Candlestick Park. The Seahawks will not only help improve my personal record to 2-2, but they will exit Candlestick Park for the final time in grand fashion; as champions of the NFC West. My flight home leaves San Francisco around 9pm and I do not believe I will be home until at least 11:30 or midnight, barring a flight delay. Look for my Seahawks/49ers game review on Monday morning. I will also chronicle my weekend in San Francisco in a post that I hope to have published by the middle of next week. Let’s clinch this everyone! Enjoy the game and for those of you attending I hope to see you there. Go Seahawks! Over the past decade-plus there have been many instances when my friends and I talk about the Kingdome. Those talks include topics such as what our most memorable experiences in the Kingdome were, what we miss about it, and how sometimes we even wish the Kingdome was still around today. On March 26th, 2000 the Kingdome was imploded and the most iconic part and the most special era of my childhood came tumbling to the ground. The same is about to happen to San Francisco 49ers fans. San Francisco sports fans have already gone through this once when the San Francisco Giants moved downtown to AT&T Park in 2000. However once the 49ers move out of Candlestick Park at the conclusion of the 2013 season, the clock will have struck midnight on the legendary building most famously known for hosting the final concert of the Beatles and hosting game 3 of the 1989 World Series when a magnitude 6.9 earthquake struck the San Francisco area minutes prior to the start of the game, shaking the stadium and postponing the series for one week. Following this season, Candlestick Park will be torn down to make way for a proposed shopping center at the site of the stadium. Next season the 49ers are moving into Levi’s Stadium, their new state-of-the-art facility in Santa Clara and thus will shift into an era of playing their home games in a modern day football stadium they can call their own. After the final game at the end of this month, a remarkable run including 42 years of memories will come to an end. Let me get this out of the way now. Personally I hate Candlestick Park. It is an absolute dump of a stadium. The seats are uncomfortable, the bathrooms are claustrophobic, and the concourses are so narrow that it takes forever to get out of the stadium after the game. Not only that but the sole fact that it housed the team I despise the most for 42 seasons gives me reason to hate the building by itself. On the inside it reminds me of a more cramped Kingdome without a roof. A lot of people would say the Kingdome was the same but many Seahawks fans including myself loved that building. That feeling of “home” for 49ers fans at Candlestick Park is the same feeling I miss about going to the Kingdome and the “home” of the “Niner Empire” will be permanently relocated which could come as a traditional shock for many 49ers fans. For those Seahawks fans that have never had the opportunity to attend a game at Candlestick Park, let me attempt to paint you a colorful picture of a 49ers gameday at the Stick. The Drive: For my first two games at Candlestick Park, we drove north on highway 101 to get to the stadium. The Stick sits along the San Francisco bay just east of the highway. You know you are getting close once the highway curves past South San Francisco and you can see Candlestick Park in the distance on your right-hand side. Once you can see the stadium you hit a straight stretch of the highway and the stadium becomes larger as you drive closer, much like seeing the skylines of large cities become closer as you drive closer. The view is even better on a clear sunny day. The highway exit wraps around “Candlestick Point” and leads cars into multiple directions into the handful of parking lot entrances, which can be a big pain if you arrive closer to game time. The Parking Lot and the Tailgating: The Seahawks are at a disadvantage when it comes to tailgating in Seattle because CenturyLink Field is located in the downtown core. There are limited parking lots surrounding CenturyLink Field and because of that fact many fans choose to drink at the surrounding neighborhood bars before the game. 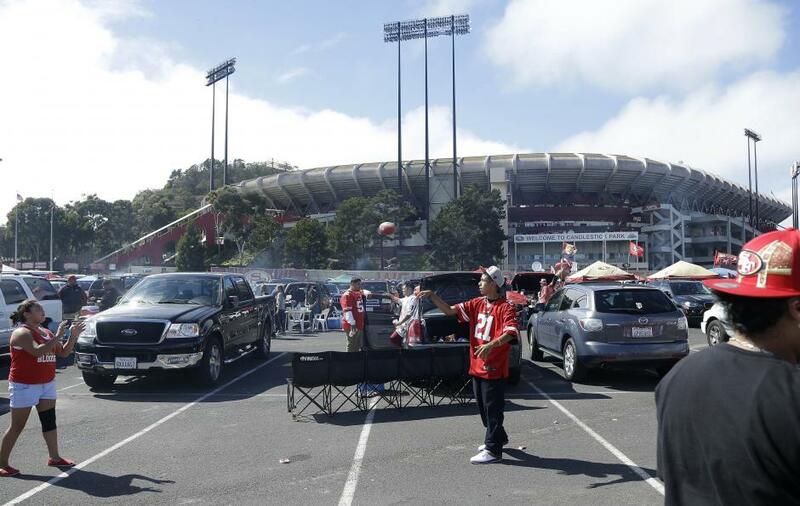 Candlestick Park does traditional tailgating the right way. The stadium is surrounded by roughly 8,800 parking spaces, housing the grand majority of fans attending each game. It is always best to arrive shortly after the gates to the parking lot open to avoid the inevitable traffic congestion that is promised both before and after the game. Once you park (around Seahawks fans of course) the fun really starts. As soon as you crack your car doors open you can smell the sweet aroma of meat being prepared on the numerous charcoal barbeques. You can see the different beautiful layouts of each car’s food and the large coolers stuffed with different types of liquor and beer. You can hear the mixed sounds of NFL pregame shows on the radio and the latest hip-hop/rap tracks blasting from car speakers. You can see the sights of fans playing beer pong, flip cup, beanbag toss, and throwing around footballs while engaging in friendly football banter. It is always a very merry atmosphere; an atmosphere that would get even the most bandwagon of fans excited for the rest of the day’s events. The Walk: If you a 49ers fan this part would not be nearly worth talking about but as a visiting fan, the walk into the stadium is a very intimidating, yet very cool thing to experience. Most fans walk down a designated stretch of blacktop that leads straight to the gates of the stadium. Tailgating fans line the sides of the walkway and it is custom for 49ers fans to boo the Seahawks fans making their way into the stadium. I personally feed off of their energy, often signaling them to boo me louder. I absolutely love it and it is even better when the Seahawks are a better team on the field than the 49ers are. The walk into Candlestick Park serves as a preview of what to expect inside the stadium as an opposing fan. The Concourses: Since I have sat in the same area of the Stick in each of my visits, I am not familiar at all with the lower level concourses. Once you enter the stadium, in order to get to the upper level you hop on an escalator that takes you right up to the upper deck. The concourse wraps around the entire stadium and they are very narrow, thus they can get very crammed as you get closer to kickoff. Concession stands and beer stands are continuously within spitting distance. The best part of the upper level concourse is the incredible view of the South San Francisco Bay, the downtown skyline, and the Bay Bridge along with the massive parking lot flooded with cars and people. It is a beautiful, picture perfect sight. The Upper Bowl: Inside the bowl of the stadium, the first thing you see is the large Candlestick Point hill that neighbors the stadium. It is directly behind the stadium and provides a pretty backdrop to everyone that sits on the opponent’s side of the stadium. The seats are a bright orange color that are big but are very uncomfortable. It is a workout to even push your seat down and the seat stays down if you decide to stand up. Although I have sat in the same area of the stadium there is no bad seat in the upper bowl. The only problem I have is that the sun is constantly beating down on the entire stadium during day games, which has resulted in two terrible sunburns to my pale pigmented redhead skin. After the Game: Leaving the stadium is a nightmare regardless of whether the Seahawks win or lose. 60,000+ people leaving the stadium all at the same time with one main road to get back onto highway 101 is the recipe for a long wait to exit the premises. Many fans go back to tailgate at their parking spaces to kill time while others try to get in the multiple car lines to leave the parking lot. It is very similar to the set up at the Rose Bowl in Pasadena, California, where they turn the neighboring golf course into a giant parking area. I waited in that parking lot for over two hours following the 2001 Rose Bowl. Most fans wait for upwards of one and a half hours to leave Candlestick Park which is a gigantic pain. In my experiences, I have left Candlestick postgame both in the light and in the dark and after a night game the stadium (like many other stadiums) looks cool with all the lights on, especially from a distance on the highway. As you leave the parking lot the reality sets in that your trip is over but in my past experiences, the anticipation of my next trip to Candlestick Park starts to set along with the sigh of relief that you survived the current trip, which is a very exciting feeling. Sunday will be the fourth and final Seahawks/49ers game that I attend at Candlestick Park. I have been through both good and bad moments in the games I have attended there. From the Seahawks 23-3 thumping of the 49ers in 2007, to the sick feeling of witnessing Ted Ginn Jr. return a kickoff and a punt for a touchdown in the 2011 season opener, I can say that I had the opportunity to watch NFL football in one of the more famous stadiums in America. People like talk about bucket list trips and stadium visits they would like to make before they die. Lambeau Field in Green Bay and Soldier Field in Chicago are a couple of NFL stadiums that instantly come to mind, but in my opinion Candlestick Park is the Lambeau Field of the west coast. This season, as part of a Candlestick Park celebration, the 49ers are counting down the top 10 moments in the stadium’s history which includes a halftime ceremony honoring each moment. In this week’s game against the Seahawks, the 49ers will honor the number two moment: “The Catch III” which occurred on January 14th, 2012 when quarterback Alex Smith connected with tight end Vernon Davis for the game-winning touchdown in a Divisional playoff win over New Orleans. Although I may not like the stadium, I have tremendous respect for the moments that occurred over the past four decades as well as the legacy that Candlestick Park will leave in the bay area. If there is anyone who doubts the ability for the Seattle Seahawks to win at home, especially against the better teams in the National Football League, I would like to meet them. 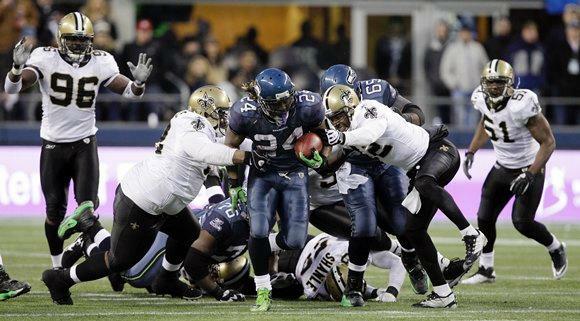 Under the Monday Night spotlight, the Seahawks routed the New Orleans Saints 34-7. With the win, the Seahawks go to 11-1 on the season, have clinched a playoff berth, maintain their 3 game lead on San Francisco in the NFC West, and the Seahawks now have a 2 game lead on the Saints and the Carolina Panthers for home field advantage throughout the NFC playoffs. There is so much to get to after this game so let me jump right into my thoughts. Seahawks Defense Forces Brees into Worst Performance Since 2006: Thanks to the pass rush pressure of the Seahawks front 7 and outstanding coverage by the Legion of Boom, Saints quarterback Drew Brees was only able to complete 23 of his 38 attempted passes for 147 total yards, including one touchdown. Brees’s yardage total marks the lowest number of yards he has thrown for since December 24th, 2006 when the Saints played the New York Giants. Although the Seahawks only forced one sack of Brees, the pressure was present throughout the game, frequently collapsing the pocket. Brees never got comfortable behind center and the noise certainly did not help. Brees was effective throwing to tight end Jimmy Graham who had 3 catches for 42 yards and a touchdown, however Brees tried to explore all of his options throughout the game and receivers Marques Colston and Kenny Stills simply could not get separation from the Seattle secondary. Perhaps New Orleans would have been more effective by throwing in Graham’s direction more often but as each drive happened and the more points the Seahawks scored it was going to be impossible for Brees to focus on one receiver and expect the Saints to get back into the ballgame. Next Man Up: It was an all-around incredible performance from the Seahawks defense on Monday night but the play of cornerback Byron Maxwell should calm everyone who was worried about a back-up cornerback facing an explosive offensive unit like New Orleans has. Maxwell stepped in for Brandon Browner and Walter Thurmond and held his ground, making 2 tackles and recording 2 passes defensed; one of which was nearly intercepted. Without both Browner and Thurmond in the lineup, the Seahawks are 5-0 dating back to last year when backup cornerbacks start in their place. Maxwell gave me no reason to think he cannot do the job and hold down the fort until Thurmond comes back in week 17. The depth of our roster especially at cornerback is proving to be an asset that is continuing to pay off. Next week against San Francisco will be a challenge for Maxwell, especially on the road. 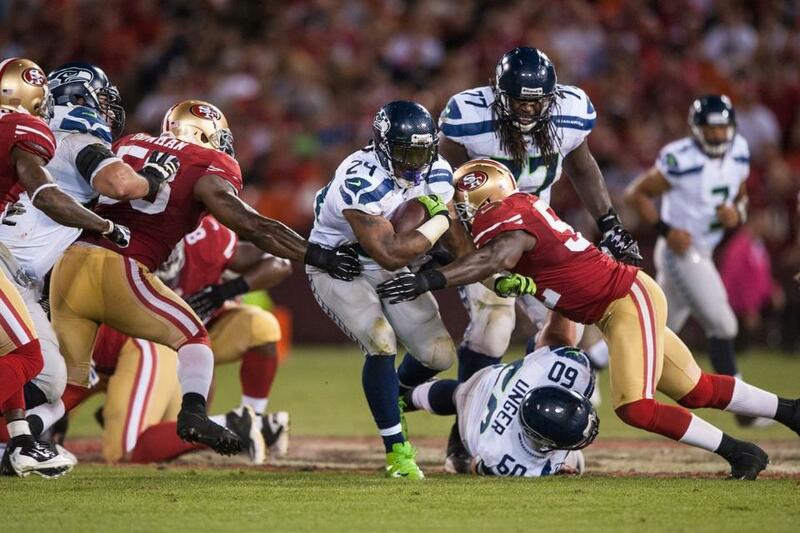 Maxwell certainly earned the faith, trust, and respect of the 12th Man on Monday night. Avril, Bennett Make Play of the Game: New Orleans had no chance of winning this game after what happened on a 3rd & 5 with just under 7:00 left in the first quarter. Defensive end Cliff Avril rushed around Saints right tackle Zach Strief and stripped the ball away from Drew Brees. The ball was caught by Michael Bennett and ran back 20 yards for a “fat guy” touchdown and a 10-0 Seahawks lead. Although this play only made it a two-score game, the feeling inside CenturyLink Field was that the 12th Man was in no way going to let New Orleans get back into this game. Plays such as this one give the fans something to scream about and once the stadium exploded and the Saints immediately got the ball back I knew what was coming; the kind of noise that gives an opposing offense zero chance of being effective moving forward. This was the number one game altering play of the night. The Seahawks outscored New Orleans 24-7 after that play and that 10 point deficit following the Bennett touchdown was the closest the Saints trailed the Seahawks all game. Meet Our MVP Candidate: During the ESPN postgame show the 12th Man let out chants of “Russell Wilson, MVP” and it got me thinking, could Wilson actually be a legitimate MVP candidate after a performance like he had on Monday night (22/30, 310 yards, 3 touchdowns, 139.6 passer rating)? Wilson now ranks 3rd among eligible quarterbacks in overall quarterback rating, and his 22 touchdowns versus 6 interceptions is one of the best ratios in the league. On the field imagine how the Seahawks would do if Tarvaris Jackson was our starting quarterback instead of Wilson. When you take significant (and I cannot stress the word ‘significant’ enough) players out of the equation is sets back your entire team dramatically. Taking Wilson away from the Seahawks is becoming more and more parallel to taking Peyton Manning out of Denver and Aaron Rodgers out of Green Bay (as Packers fans are currently learning). If he keeps up his dynamic production for the rest of the season, I would consider Russell Wilson a serious candidate for the 2013 NFL MVP award. Thoughts on New Orleans: Take away the primetime factor and the home field advantage out of Monday’s game and I think the Saints would have had a better chance of staying with the Seahawks. No team would have much of a chance in an environment like what the Seahawks hosted on Monday Night. The Saints are a very good team and I could definitely see a rematch next month. Right now however the Saints need to be more and more worried about losing the NFC South to the Carolina Panthers. The Saints have the capability of getting to the NFC Championship Game and perhaps even the Super Bowl, but if they have to pay Seattle another visit in the coming weeks I expect their goal of a Super Bowl championship to evaporate. Let Me Be Bold: The Seahawks are now 6-0 at home this season and have beaten both San Francisco and New Orleans in primetime settings. I now expect the Seahawks to earn home field advantage throughout the NFC Playoffs and if that is the case, I believe the Seattle Seahawks will represent the NFC in Super Bowl XLVIII. All worries about a possible home game letdown at some point this season have transformed into a solid, unmistakable truth: NO, and I mean NO team can come into our house against this team and win. If you thought the atmosphere at CenturyLink Field was crazy for this game, just imagine what it will be like here in the playoffs. From where I’m sitting, if you are a Seahawks fan I would definitely be comfortable making your reservations for New York City immediately. Random Thoughts: I took my friend Dylan to the game and we started the day by having lunch at Chuck’s Hole-In-The-Wall Barbeque on James Street downtown which was a long overdue first for me. In my opinion it is the only place around town that challenges Dixie’s in Bellevue for my favorite BBQ restaurant. I highly recommend the brisket with spicy BBQ sauce… Got to the bar at 12:30 and all the tables were full by 1. That was pretty amazing. Good thing we got one of the three booths… It’s really fun to walk across the street to the stadium as the sun is setting. It really gets me excited for the primetime feel of a Seahawks game… The defense was introduced this week and although Byron Maxwell started in place of Brandon Browner, the Legion of Boom was still announced to the crowd as a group… Ed Hochuli deserves to be the referee for Super Bowl XLVIII. He did an incredible job explaining calls and very few penalties were inaccurately enforced… I should clarify, he did an incredible job explaining calls except for when he got too into detail when he said at one point while explaining a call “we didn’t let the team [run a play] because we were stretching our balls.” [Insert joke here]… Pizza is to damn expensive in sports stadiums… There were very few Saints fans in attendance this week. That was a pleasant sight to see… After the game we made our way down to the lower level for the postgame show and it was packed. It is amazing to wonder what a game would look like down that close. In the upper deck the players look like ants sometimes and on the lower level not only is the game closer, but the stadium feels incredibly big. I can only imagine what the 12th Man sounds like from the lower level… Let me say this, I appreciate the job that alcohol enforcement does on a game-by-game basis but sometimes it seems like they overstep their job description and take things way too seriously. Alcohol enforcement was turning away fans that wanted to be a part of the postgame show crowd and were calling in Seattle police officers to kick out fans who were doing absolutely nothing wrong. Please stick to what your job entails, AE; kicking out the unruly fans that are interrupting the fan experience and making fools out of themselves… I got a thumbs up directly from Ray Lewis. That was pretty cool… It feels so good to be 11-1. It only makes next week’s trip to San Francisco that much more exciting. This week will be a busy week on the blog. It is our second hate week of the season as the Seahawks now focus on the San Francisco 49ers. Check back midweek for a special commentary piece highlighting our upcoming game against the 49ers. My game preview of Sunday’s Seahawks/49ers game will be up early Saturday morning. Go Seahawks! The Seahawks kick off the final five games of the 2013 regular season this week on Monday Night Football as they host the NFC South leading New Orleans Saints. The Seahawks are 10-1 and currently hold a one game lead on the top seed in the NFC playoff race. Enter the 9-2 Saints, who are the ones that trail the Seahawks in the NFC standings. The winner of this game will have the edge for home field advantage in the NFC playoffs. The all-time series between these two teams is tied 6-6. Their last meeting came in a 2010 NFC Wild-Card playoff game when the 7-9 Seahawks upset New Orleans 41-36. Of course the iconic moment of this game was Marshawn Lynch’s 67-yard “Beast Quake” touchdown run late in the fourth quarter that essentially cemented the Seahawks with the victory. There is a lot on this line this week and a nationally televised audience will witness one of the more highly anticipated games of the second half of the season. Here is what I will be looking for out of both the Seahawks and Saints in this game. I start with the Seahawks defense because we will be without a key starter in the secondary. Cornerback Walter Thurmond has been suspended 4 games for violating the league’s substance abuse policy thus he will not play this week. Byron Maxwell will start and Jeremy Lane will also see playing time opposite of Richard Sherman. The main key on defense this week is to play smart and to not give up big, game-altering plays. Facing an elite quarterback such as Drew Brees, it will be likely that the Saints offense will try to stretch the field and with younger players filling in in the secondary, the chances of coverage’s being blown could be greater than if Thurmond or Brandon Browner were playing. In order to prevent Brees from having time to make deep throws our pass rush needs to have one of their best games of the season. The Saints offensive line ranks 5th in the NFL in sacks allowed so it will be necessary to send various blitz packages to confuse New Orleans and to force Brees into sacks and bad decisions. I have full confidence in Lane and Maxwell to step up and play well but their matchups this week are not favorable, especially after having a long break following the bye week. After scoring 41 points against Minnesota two weeks ago, the Seahawks offense is primed to breakout starting on Monday night. It all starts with the running game. If the Seahawks can get Marshawn Lynch going early, control the ball, and control the clock, the Seahawks will be well on their way to a victory. The problem is that Saints defensive coordinator Rob Ryan is one of the best coaches in the game and he will certainly be orchestrating a gameplan that will put a focus on stopping the Seahawks running game. It will be very important for the Seahawks offensive line to protect Russell Wilson so he can utilize all of the weapons around him, especially since wide receiver Percy Harvin will not play due to a hip injury. Golden Tate will be Wilson’s go-to guy this week and Jermaine Kearse could also make a big impact this week. Keep your eye out for those two playmakers to get the ball in their hands often this week. The New Orleans Saints boast one of the league’s most dominant offensive units. They are good because of a two-headed monster; the interchangeable and underrated running game featuring running backs Pierre Thomas and Darren Sproles, and the powerful passing game led by quarterback Drew Brees. Brees is 353 yards away from becoming the first quarterback to throw for 4,000 this season. The Saints passing game ranks second in the league overall and it will be the primary emphasis for the Seahawks defense this week. After studying the Saints on film I took away an interesting statistic. In the “first 15” (the first 15 plays previously scripted for an offense to run) the Saints threw the ball at nearly a 2:1 ratio, more than any other team the Seahawks have played so far this season. Drew Brees is known for picking apart the weaknesses of opposing defenses and he does an excellent job doing so, which is why I believe he will try to throw to wide receiver Kenny Stills often this week since Stills will line up opposite of either Byron Maxwell or Jeremy Lane. There is also a big matchup to watch in the middle of the field, literally. New Orleans tight end Jimmy Graham is Brees’ favorite receiver and it takes multiple players to bring Graham down. Look for Kam Chancellor to shadow Graham on passing plays, as Chancellor is the biggest defender in the third level of the Seahawks defense. The Saints dominant offense has been around for a long time but it is the Saints defense that has helped turn the team into an elite power. The Saints defense ranks in the top half of the league in both passing yards allowed (3rd) and rushing yards allowed (15th). When looking at the Saints defensive stat sheet there is one column that worries me greatly this week: the Saints do an incredible job of rushing the passer. The intimidating pass rush threat could force Russell Wilson into bad throws this week. Wilson must know where cornerback Keenan Lewis is lined up on the field, as Lewis leads New Orleans defenders in interceptions with 3. In regards to the Saints pass rush, 14 different players have recorded sacks this season and 7 of those players have recorded 2.5 sacks or more. Cameron Jordan leads all Saints defenders in sacks with 9.5 but my X-Factor player to watch this week is linebacker Junior Galette. Galette has 6 sacks so far on the season and has forced one fumble. Galette is New Orleans’s Bruce Irvin; a pass rush specialist who sees most of his playing time in third down situations. If Russell Wilson and Marshawn Lynch can move the ball effectively in early down situations Galette could become a non-factor much like how he was against Atlanta last Thursday night. There are two other added elements to keep your eye on this week. The first of which is the weather. The temperature at kickoff is expected to be in the mid to low 30’s and the last forecast I saw calls for a 40 percent chance of snow showers. The last time the Seahawks played a primetime game in the snow was in 2006 and the Seahawks were able to run for 235 yards in that game against the Green Bay Packers. Although it is unlikely, if snow becomes a factor this week I give the edge to the Seahawks, as the Saints do a better job stopping the pass than the run. The other thing to keep an eye on this week is the noise factor. I always emphasize that the 12th Man seems to have a bigger impact in primetime games and this week the intensity inside CenturyLink Field will definitely be higher. To make matters better, the 12th Man will be attempting to regain their status as the world’s loudest fans as they try to once again break the Guinness World Record for “loudest roar at a sports stadium” as was announced earlier in the week. Bad weather and noise could be the ultimate recipe for the Saints to struggle so the Seahawks must take advantage of these circumstances. Random Thoughts: The blue jersey/blue pants combination will be seen once again this week. I expect the Saints to wear black pants with their white jerseys… Mike Tirico and Jon Gruden have the call for ESPN this week… It would be cool to try to get a picture with the ESPN pregame crew consisting of Stuart Scott, Trent Dilfer, Steve Young, and Ray Lewis. I tried to get a picture with Bob Costas back in 2011 when Sunday Night Football came to town but I failed… Expect to see an iconic Seattle sports figure raise the 12th Man Flag. It has become customary for a well-known Seattle icon to raise the flag before bigger games… Ray Dalton will sing the national anthem before the game. I guess he’s taking a break from the Macklemore & Ryan Lewis world tour… One of the coolest things to see at a primetime Seahawks game is when the video board says “ESPN, can you hear us?” If you’re going to the game on Monday night you should know what to do when you see this… The giveaway this week is roller banners that say “LOUDER” along with a Seahawks beanie. Can I get a rally towel one time Seahawks?!?! I guess they are saving towels for our home playoff games… Ed Hochuli is the referee this week. In my opinion Hochuli is one of the best referees in the NFL. He does a really good job of explaining his calls… I wonder if the weather will prevent Hochuli from showing off his trademark muscles. We’ll see… It’s going to be a long pregame on Monday before the game. Good thing we’ll be down there before traffic really gets bad… I love late season primetime games because it is dark by the time kickoff rolls around… I love the cold weather, also… I’m sure a lot of memories of the last time we played the Saints are going to run through my brain on Monday. It is hard to rank that game but that playoff game is no doubt in my top 3 of sporting events I’ve ever been to. Seahawks Playoff Outlook: The Seahawks currently hold a one game lead on New Orleans for the number one seed in the NFC playoffs and we hold a 3 game lead on San Francisco and Arizona for first place in the NFC West. If either Arizona or San Francisco loses on Sunday, the Seahawks can clinch a playoff berth with a win. Here are the matchups to keep an eye on this week that could affect the NFC playoff race. Teams to note are bolded. Prediction: The way I see it, if a 7-9 Seahawks team can beat Drew Brees and the Saints, a 10-1, Super Bowl contending Seahawks team can surely beat Drew Brees and the Saints. With the Saints in town and a healthy, rested Seahawks offense a lot of people may think this game will be an offensive shootout much like what happened in the playoffs three years ago. I do not believe this game will be as high scoring and both defenses will make their presence known. The Seahawks will make one or two bigger plays than New Orleans this week and that will lift Seattle to victory. 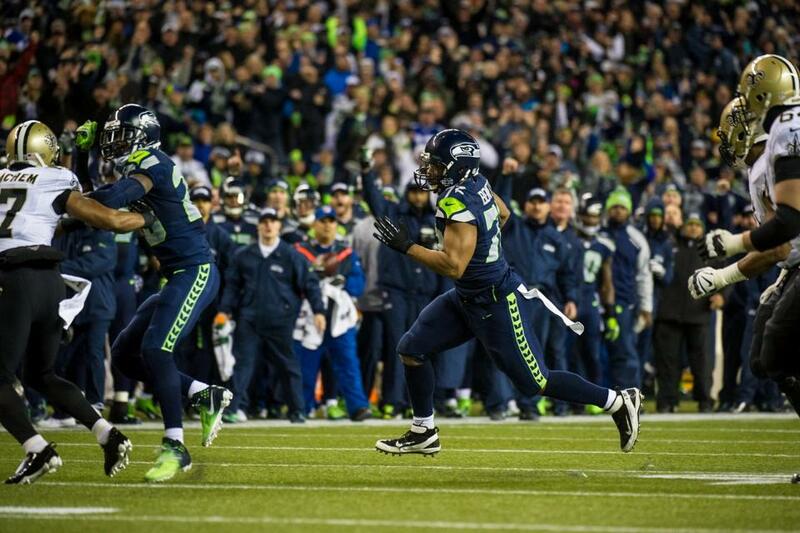 Marshawn Lynch and Golden Tate will score touchdowns for Seattle and linebacker K.J. Wright will intercept a Drew Brees pass in the fourth quarter that will seal the win. The Seahawks will go to 11-1 and will all but officially clinch the NFC West and home field advantage throughout the NFC playoffs. Following Monday night’s game will start a very busy week on the blog. Check back Tuesday morning for a review of our game against the Saints. Enjoy the game everybody. Go Hawks!